China is spooking the almighty U.S. central bank -- and investors. Federal Reserve chief Janet Yellen mentioned the word China six times and "global" (read: China) 10 times in her press conference Thursday. It's is a big change for the Fed, which barely talked about global worries before. "Heightened concerns about growth in China and other emerging market economies have led to notable volatility in financial markets," Yellen said. The fears were strong enough for the Fed to leave its benchmark interest rate at 0%, where it's been since the depths of the financial crisis in 2008. It wants more time to see how the global headwinds abroad play out at home. Investors are now even more worried about the global gloom. Stock markets around the world tumbled Friday. It's no secret that China's economy is slowing. The question is how much it will impact the rest of the world, including the United States. This is a pronounced shift for the Federal Reserve, which has mostly been stressing for the past year that it sees very solid improvement in the U.S. economy -- so much so that it has signaled numerous times that it will likely raise rates in 2015 for the first time in about a decade. That's a big question mark now. .If there's so much uncertainty in raising rates now, is it really likely to be any clearer in October or December? America's trade with China accounts for less than 1% of GDP. But when you factor in what's happening around the world, it becomes more alarming. Canada, a major U.S. trading partner, is already in a recession, largely because China is no longer buying commodities like it once did. Many emerging markets like Brazil are also struggling for the same reason. The Fed is notoriously cautious in its statements. The bank knows that Wall Street, Congress and investors around the world look closely at every word. In its official statement, the Fed said: "Recent global economic and financial developments may restrain economic activity somewhat." "The Yellen Fed is acknowledging that the U.S. is now so closely integrated into the global economy that it can no longer focus on just domestic conditions," says Bernard Baumohl, chief global economist at the Economic Outlook Group. America's economy continues to chug along with decent growth of just over 2%. The Fed called it a "moderate" pace this week. Unemployment has also fallen to a 7-year low of 5.1%. At the press conference, Yellen tried to send a balanced message by emphasizing that the trouble abroad has "not fundamentally altered our outlook." 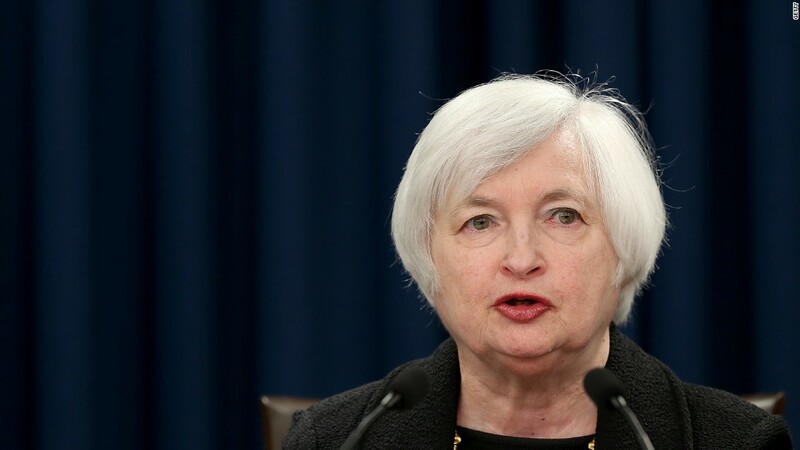 However, her multiple references to China and the Fed's inaction speak louder than any efforts she makes to soothe markets. Investors sent stocks around the world slumping on Friday. There's even more uncertainty at the Fed and in the market about just how bad the global economy is.